Discussion ClubCorp golf course member experience? ClubCorp golf course member experience? I am considering joining a ClubCorp golf course. The ClubCorp benefits on paper seem great especially with access to their network of courses. Anyone on here a member of one of their courses and have any positive or negative feedback? I Have been a clubcorp member for over 5 years, and so far I really enjoy this membership. Especially if you have multiple courses owned by them in your area, or you travel a lot and have some flexibility on the time. Here in my area, we have 5 decent courses owned by clubcorp, where you get 2 rounds per month, which means if you like you can play 8 rounds in 4 different private or solid public course other than your own courses every single month. Plus you only pay cart fee for these 8 rounds. I really like their member service line. Very efficient, and people are willing to help. I traveled to different cities and played some very nice private clubs including Firestone country club ( when they have a very good package to let you play south course). Just a 3-5 minutes phone call. Never have issue. I am glad my home course got bought by clubcorp. Not only they spent over 2 million dollar to renovate the course, but they bring some very solid benefit to the members. Overall, I give a lot of credit to Clubcorp. Hope these information is helpful to you. My home course is a member, but the selection in our area/areas I frequent is minimal. I personally don't see much value in it for those reasons, but it's a freebie from my other membership. Definitely interested in hearing about your experiences. I have to agree, been a member for a little over a year and it has been very positive. Can you take a guest with you to the other courses? Thinking of shifting our corporate membership to another course in town that is ClubCorp. The only time I would play the other courses is when I'm in Houston or Dallas though (with customers). No others nearby. Yes you can take guests but there is a guest fee. The guest fees I've seen have been between $80-$180. Posts have talked about playing other ClubCorp courses in their local area, I believe that sort of arrangement requires additional membership in a regional society (for example in Raleigh there is the Triangle Society, Dallas Ft Worth has the Dallas Ft Worth Society...). My understanding is these societies are an additional fee, but still a good deal if you like playing all over the place. Something not mentioned that my wife enjoys is the dining benefit. In many larger cities you get 2 free meals a month at the dining/social clubs (pay gratuity and alcohol). Without the dining benefit I don't think I'd have my ClubCorp membership. I was an asst pro and a member at a CC course for over 10 years. The network of courses that you can play for cart fees or at a reduced rate is worth the price of admission. Gotcha. I'm good with a guest, just wouldn't make sense for me if I wasn't allowed guests since the only other clubcorp courses I would play are out of town and for work. I have been a member at a ClubCorp club for 6 years. The club is great and the travel options make it that much better. We have played in Palm Springs, Outer Banks, NC, Mexico, Virginia, Raleigh, etc. We basically plan our vacations around where we can play. One thing not mentioned is the free use of loaner clubs when traveling. This is great especially considering the cost of flying with your clubs. And these are not cheap knock-offs. Was Titleist for a few years, now it's TaylorMade. They have mens, womens, stiff, regular, lefty, even kids clubs. Have always been treated great when traveling--ClubCorp always pushes this as "your club away from home"--and they do seem to follow through. Also, every Summer they waive the guest fees when traveling (once per month). Like others have pointed out, the perks are awesome. If you join and become a ONE member, you can travel to other CCA facilities and play for a cart fee, we have over 140 Courses and several social clubs that are available to you as a member. 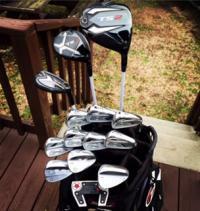 The rental program that Dave has pointed out is a very nice feature, currently our clubs carry Taylormade RocketBladez rentals, You will receive 20% off soft goods and food and beverage discounts. Please dont take this as me trying to sell you, Im a Golf Professional with CCA and just wanted to point out some of the features this great company offers. What guest fee are you referring to? My understanding is that for golf, you only pay the cart fee at the network courses when traveling, or do they also charge a guest fee? My former boss belonged to a ClubCorp course in Plano, TX and liked it. He definitely took advantage of the chance to play other Club Corp courses around the US. It has a very nice clubhouse, but the courses are just ok. The last time I saw Gleneagles, it had serious condition issues. The very first Club Corp course was in Dallas as well (Brookhaven). The last time I played it, it was one step above a decent muni and was completely devoid of drinking water (in July, when the temperature was 105). That kind of soured me. My experience is jaded, however, by the fact that i belong to a very high end private club with a silly maintenance budget. Not your most realistic comp. I think in the end Club Corp is managed a lot better than run of the mill or smaller private clubs, but the clubs aren't as nice as top end private (thought they also aren't generally in that price range). A club corp course is probably a lot more likely to get capital improvements than a smaller private club. Update on how clubcorp membership is? Thinking of trying for a year. Just don't want some stupid fine print coming up and having everything promised be an additional fee here or a hassle there. How has pace of play been at most of the clubs you visited? Only asking cause I went to my local club and pace of play was pretty slow considering it was private. I was a cca asst. pro for over 5 years. The bang for the buck is a no brainier.. If you travel sign up right now. You can take guests and you get free dinners at most clubs wether it's golf or dinner clubs. There's courses everywhere and it's the biggest private club management company out there. What course are you looking to join.? I was a pro at 3 of them... VINITERRA in Virginia but isn't cca anymore.. River creek in northern va (great course fyi) and quail hollow in Ohio... Enjoyed membership at them all. I was a member but dropped due to lack of courses close by and cost. If you live in Atlanta or Dallas it's a great deal. Live in a city with only a course or two it's completely different. If you don't travel often then the network of courses sounds good but will you really utilize them and you are paying for them with the ONE membership. Even if you don't play other courses you are basically forced into the ONE membership. Decline and the food prices kill you. Half off elevated prices with the one membership PLUS 20% service charge and tax which are based off the full price not half off price. Add those to high cart fees and monthly bill can be shocking. Expect 3-5% annual dues increase and food increases. Bottom line it's not a no brainer unless you live in the right area. Anybody have any recent experience with ClubCorp? Been at a Club Corp facility for ~3 years now. Love the network of courses to play. While I play 70-80% of my golf at the home club, having options to dominate a neighboring track is fantastic. I would grade my experience at (A). 50+ members at my club are resigning this week. CCA has done a pathetic job with course maintenance and worse at a member experience level. I’m a member at a clubcorp in Atlanta. There are about 10!courses between 25-45 minutes driving distance for between $17-25 cart fee and four other premium courses for $75. The premium courses are top notch but expensive to play. If I drive about 1hr-115 there are additional 6 more courses I can play and many of these courses have 36 holes. It is totally worth it in my opinion especially in Atlanta and the pricing is definitely affordable. I have not regretted joining clubcorp! Played there a few times. Haven't played this year but I was curious if not hosting the tournament would diminish the condition they kept it in. Course staff has been a revolving door and with the course on pace for 37k rounds this year, the course cant heal. We lost the greens this year and only when people threatened to leave, they agreed to replace them in may of next year. Food, service and the rest is truly 3rd world. We have had a couple different superintendents in my short time and honestly don't like the newest one. But our course is still better options than the public ones in my opinion, and I use the travel benefits a lot as well. I did notice when I played there and at the clubs of prestonwood how many ball marks there were. But that is typical of Bentgrass but way more than when I played at TPC Craig Ranch. What type of greens are they going to put in? It will be interesting to see how things unfold with the new CEO. He was with American Golf in their heyday, when the money was flowing in and nothing was flowing out. The customer service side of them was awful. Hopefully things have changed and Club Corp will not follow the same path. I've only been a member for almost 2 years. In that first year it seems like Clubcorp would buy a course fairly often. Maybe once a quarter or so. Seems likes since the big deal, they haven't acquired anymore and things overall seem to be in a decline.